These handy telecom installer tool kits contain essential industry standard telecommunications tools and test equipment. Fluke Networks' Electrical Contractor Telecom Kits are comprised of industry standard telecommunications tools and telecom test equipment, in a durable cordura handy tool bag. The telephone hand tools kits are designed for telecom technicians who install, test and troubleshoot phone and data lines. 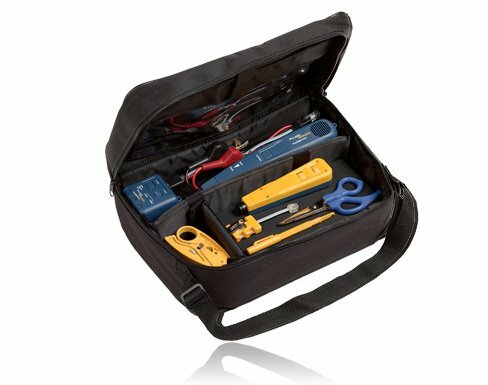 Electrical Contractor Telecom Installer Tool Kit Bag I includes a TS®30 Test Set w/ Angled Bed-of-Nails Cord, D814 Impact Tool, EverSharp 66/110 Cut Blade, Electrician's D-Snips, Cable Stripper, Standard 4-Wire Modular Adapter and Probe Pic. Electrical Contractor Telecom Kit Bag II includes the same items but offers the Pro3000 Analog Tone & Probe in place of the TS30 Test Set.